First NonViolent Action – it works! 6/21/2000 – John appears at the U.S. Courthouse. Things are not very busy, the magistrate is not even present in the Courtroom. An assistant US Attorney, Mr. Michael Olmstead sits down with John to discuss resolution. John explains to him that all the local charges were dismissed. That he plans on returning to the building in September to “exercise his right of free speech” and to also “petition his congressional representatives” by continuing his peaceful walk. The US Attorney acknowledges the right to peaceful petition, comments on the fact that a Trial might be hard to win and withstand appeal. They agree that his efforts may continue and that all Federal charges will be dismissed. 6/15/2000 – John received 6 Federal Appearance Tickets in the mail. These were all issued in December regarding his activity at the Federal Building (before he was finally allowed to do it). He is charged with: “unwarranted loitering”, “unauthorized loitering”(3), “prohibited protesting”, and “failure to comply with officer.” View one of the tickets. He will not pay the fine and hopes that in light of what happened at the local level the charges will also be dismissed. His Court Date for arraignment is June 21, at 9:30. U.S. Courthouse for the Northern District of New York. 5/31/2000 – Early in the month, John had been contacted by the Science Editor for the German Magazine GEO (http://www.geo.de). It is the European equivalent of our National Geographic. She told him they were doing an issue on “gender issues” in the United States and would he mind talking to a writer? At the end of May, Mr. Winkler, a writer for the magazine arrived from Germany and John spent a few days with him. John arranged for him to speak with other parents and local attorneys. The writer then continued his trip to some other U.S. Cities. 5/2/2000 – Syracuse City Judge Higgins dismissed all remaining charges. 4/13/2000 – A productive meeting is held with the local staff of Congressman James Walsh to discuss the need for reform. While they had reasons why “reform” wasn’t appropriate for Federal Action — when made to see it as primarily a “Civil Rights” issue, they admitted Congress was the place to make changes. It appears the dialog will continue, waiting for letter from them in the next two weeks. We sent them a thank you letter. 4/6/2000 – John enters the building as he has for over 30 days. Building security shows him a new Order and asks him to leave the building. Because of the chance to start meetings with the Congressman’s local staff, John complies. “I was able to call his Washington office the next day, April 7. I was given the name of the Office Manager in Syracuse. Told to contact her Monday to setup an appointment. All very good news! March/April 2000 – Ongoing “march” inside local Federal Building calling for Congressional Hearings into reform. Your participation is welcome, check this page for schedule/complete details. After no response, sent another letter to Congressman James Walsh. Another group sent a letter to Congressman Mark Udall of Colorado. Sent a new letter to U.S. Senator Charles Schumer asking for his help in reform. 3/2/2000 – John returned to the Federal Building again (News Release). Three other parents (two business people and one attorney) were on hand to walk with John into the building and accompanied him to the 8th floor. Building security did not interfere as John took out his picture and began to walk around while the others watched. He walked for approximately two hours and will return again tomorrow at 2pm. 2/24/2000 – John appears again in front of Judge Higgins (jailed since the 15th), and is again released. His attorney is attempting to have the entire order vacated (found invalid). Efforts by people to contact Congressman Walsh were helpful, it appears his office did attempt to contact the Judge and DA in an effort to get his name OFF the order (details below – 2/7). John plans on returning again on Thursday, March 2nd. 2/15/2000 – John returned to the Federal Building and was arrested in violation of the Order of Protection (see below – 2/7). He was arraigned the next day by City Judge Merrill and a $500 bail was set. John plans on remaining jailed at the Onondaga County Justice Center until he is released by a Judge. Another news release was sent out. 2/7/2000 – Mr. Chuck Keller, representing John, and the DA presented their arguments to Judge Higgins regarding the constitutional issues. The Judge wanted more time to make a decision and told the parties to return to court at 2PM on Feb. 8th. At that session all the criminal contempt charges against John were dismissed and ‘most’ of the trespass charges. The Judge issued another Order of Protection. which was more specific in scope and appeared to be meant to protect Congressman James Walsh from a “stalker”. John plans on resuming his efforts at 2PM on Tuesday (2/15). of next week. 2/3/2000 – John returned to the Federal Building and was arrested. He was arraigned the next day in front of Judge McKinney and was again released. The next major court date will be Monday, Feb 7. 2/1/2000 – John returned to the Federal Building and was arrested in violation of the Judge’s order (see below). Another news release was sent out. He was arraigned the next day in front of Judge McKinney and was again released — a copy of a letter explaining his effort was sent to the Judge. He plans on returning again on the 3rd. 1/31/2000 – No change after another meeting with Judge Higgins, some of the simple trespass charges were dismissed — the criminal contempt charges remain and still at issue is the Constitutionality of the order, with no firm resolution in site, another conference between the lawyers and the Judge is scheduled for Feb 7th. John plans on resuming his efforts on February 1st. 1/24/2000 – The lawyers had a private conference with Judge Higgins. A decision on dismissing the charges may occur on the 31st. John will try again at the Federal Building next Tuesday, Feb 1st. 1/21/2000 – A front page story is printed in the Wayne County Courier-Gazette (which covers John’s home town). The article does a VERY NICE job describing our goals and methods. In a surprise — later that same day John is released by City Judge Brunetti. His next Court appearance was on Monday, Jan 24th (2 p.m.) in front of City Judge Higgins. 1/13/2000 – John went back to the Federal Building and was arrested for violating the same order (see below). He was again arraigned in front of City Judge Young and released. He plans on returning again Monday (Martin Luther King Day) — building was locked for the holiday. 1/11/2000- John went back to the Federal Building and was arrested again for violating the order previously mentioned (see below). He was again arraigned in front of City Judge Young and released. He plans on returning again on the 13th. 1/8/2000 – John plans on returning to the Federal Building on the 11th to resume his walk. In an attempt to “diffuse” the issue, he writes to the Judge Townes requesting the old order be lifted. 1/7/2000 – John returns to the Federal Building. Federal Building Security had received a copy of a prior “Order of Protection” barring John from the building. He was arrested and held in custody over night. On Saturday he was arraigned in front of City Judge Young for charges of trespassing and criminal contempt (for violating the order). He was released. 1/6/2000 – John returns to Federal Building and goes to 13th floor (Congressman Walsh). He is followed briefly by security staff, but then allowed to “walk” unbothered for two hours before leaving. A news release is sent out. The plan, like earlier at the Court House (below), is for him walk every day from 2-4 PM. Your participation is encouraged, click here for details, a public permit is being arranged so folks can walk in the Plaza outside the building next Thursday and Friday (Jan 13 & 14). 12/27/99 – Read a letter sent to local leaders, asking to be able to demonstrate upstairs in the Federal Building. Got this reply from Congressman Walsh (who explained he didn’t have the authority to approve such action). John then wrote to the Building Manager and let them know he would be back to continue his efforts on Jan 6th. 12/22/99 – John was arrested again at the Federal building and is in custody at the Public Safety Building in Syracuse, NY. He was arraigned on Thursday (12/23), again by Judge Townes — the DA recommended no bail be set — he was released. The Federal Building is closed on Friday, John plans on spending a peaceful Christmas Holiday with his mother. 12/20/99 – John was arrested again at the Federal building and is currently in custody at the Public Safety Building in Syracuse, NY. A new news release is sent, highlighting the unique protest method. The next day (12/21)John was arraigned by City Judge Sandra Townes, ordered to stay away from the Federal Building and released. 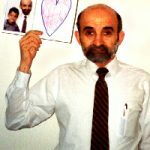 12/17/99 – John was arrested, by Federal Police, at the Federal building, carrying his sign. He was also charged by City Police for trespassing, and is currently being held at the Public Safety Building in Syracuse, NY. He was arraigned the next day by City Judge Higgins and released. Plans on returning again Monday. “the in and out over the past week has been a bit exhausting. I always take the time to pray at the downtown Cathedral before each effort. Some folks ask me ‘how do I know this is going to work?’ — and I tell them, ‘I don’t.’ I don’t control the results, I just try to quietly stand up for what I believe. 12/16/99 – John was arrested, by Federal Police, at the Federal building, carrying his sign, charged with “loitering” and released. He was “interviewed” by Michael Olmstead, an assistant US Attorney for the Northern District of New York. 12/10/99 – Last day of the “walk” at the Court House, John was there from 10am-noon, and 2pm-4pm. “Doing that type of walk inside the Courthouse was not part of my plans, but it was a good experience. Not any of this was planned even a few short days ago. It was nice to see “good things” happen and people take time off from work and family to show support. By the end of the week a lot of the staff was smiling at me and when I left on Friday I shook hands with three different deputies — they all expressed respect for what I was trying to do and my ‘method’ “. I tried to ‘practice what we preach‘ at Kids-Right. As I picketed I was always polite and smiled — even to the folks who poked fun at me (some of those same folks expressed their sympathy by the end of the picket). I wasn’t there to blame anyone or vent my anger. I felt I was among friends. My message was very clear — I AM HERE BECAUSE I LOVE MY CHILD AND WANT TO PARTICIPATE MORE IN HIS LIFE — who could argue with that agenda!” People are pretty good if you give them a chance. 12/9/99 – “Rally” at the Court House, parent’s groups “50/50” and “FMER – Father and Mothers for Equal Rights” participated along with other local people. A press release was sent out by FMER prior to the event. 12/2/99 … – John freely marches quietly, with his sign, around the inside of the Court House from 2pm-4pm. He plans on making this a “daily” activity between 2-4pm (Mon-Fri). Please consider joining him, even if you can only do it one day. Check here if you are considering joining the walk. At 1:30 PM you can almost always find him praying in the Catholic Cathedral by “Columbus Circle” — which is right across from the front steps of the County Court House. Contact him for more details. 12/1/99 – John enters the Court House as he has on two prior occasions. Instead of being arrested — he is allowed to protest inside the building! Carrying the same sign he was allowed to silently walk the corridors from 2pm – 4pm. He plans on returning to the building at 2pm on Thursday, Dec. 2nd. Another Press Release is sent. 11/22/99 – At approximately 1PM, John returned to the Court House with his picket sign and was arrested again. Sends a letter to New York’s Governor asking for an inquiry. He is arraigned and John released again. He is planning on returning to the Onondaga County Courthouse again on Wednesday (12/1/99). 11/17/99 – 11:00 at the Onondaga County Courthouse. John took a small sign with Dom’s picture and the message “I LOVE DOM” and just silently picketed in the Court House Lobby. He was arrested. A lawyer friend recommended this approach since there would be “more witnesses”. He is arrested in a professional manner by Sheriff’s Deputies — during processing a couple of them express understanding for his goals and admire his dedication to his son! The next day John is again arraigned in front of Judge Merrill (who asks him if he has read Cervantes’ Don Quixote). He is ordered not to protest at the Court House. 11/12/99 – At approximately 4PM, John is released. He returns to the Public Safety Building in Syracuse. In a rather frightening action — the Police decide to “punish” him by taking him for a Psychiatric Evaluation. He is held for an entire weekend and then released on Monday (11/15). One of the doctors comments to him, “…bringing you here like that is inappropriate. Its a violation of your right to protest. But we have to ‘trust’ the police if they bring someone in for evaluation…’ John is attempting legal action for false arrest. 11/11/99 – John went down to the Public Safety Building in Syracuse, NY, to start a jail protest strike. 11/10/99 – Press release sent out prior to the event.